As part of our World of Quilts Show, NSQG runs a raffle whose net proceeds benefit a not-for-profit charitable organization selected by Guild members. The grand prize is a bed-sized quilt constructed by Guild members. Tickets can be purchased at the Quilt Show or from NSQG members. The drawing for the Charity Raffle Quilt and any other prizes is held at the May NSQG meeting at Kennedy Catholic High School, Somers, NY. This year’s charity quilt is queen size and made from a traditional pattern called “Jack’s Chain”. Fifty of our members participated in making the blocks to create this fabulous quilt. It consists of approximately 550 nine-patch blocks and 75 hexagon blocks. 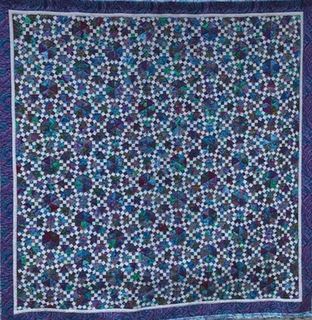 The quilt, while scrappy, uses Kaffe Fassett fabrics in a pallet of blues, purples, and greens with a white solid. The back of the quilt features “back art” using the extra 9-patch blocks and scraps. A special thanks to quilting group, Pat Bobletz, Helen Boland, Denise Isherwood, Carolyn Langevin, Kay Marcarello, Sam Morrissey, Linda Ostrander and April Russell for their help completing the quilt top. The quilt is quilted with an orange peel design and wool batting by Mary Cannizzaro. First Prize: Pins and Needles of Mt. 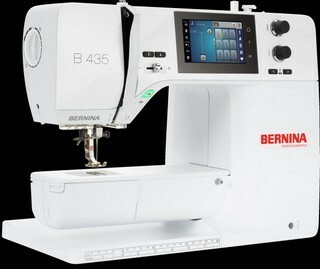 Kisco has donated the BERNINA 435, MSRP $1999. It is one of the newest models from BERNINA. Perfect stitches are obtained with the BERNINA Hook, which features the Jumbo Bobbin. A color touch screen makes stitch selection easy. Powerful DC Motor, large selection of stitches and alphabets, adjustable presser foot pressure, and BERNINA high-quality accessories. If you would like to nominate a future charity, please read our Charity Guidelines. – presenting the finished quilt to the membership at the second season September guild meeting.